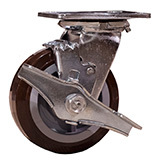 Global Caster Corporation offers a wide range of casters and wheels from light duty to heavy duty, swivel casters, kingpinless casters, pneumatic, and more. Let us fill all your needs with our quality products. Search the categories below to find exactly the item you need. Light to Medium Duty Material Handling, Bakery Equipment, Stocking Carts, Moving Dollies, Food Service Op,, Equipment Maint. Carts, Office, Computer Room, Lab & Institutional Equip. Platform Trucks, Warehouse Carts, Dollies (Machinery) Stock Picking Trucks, Freight Terminal, Food Service Carts, Hotel.Housekeeping Carts, Excellent Series for Industrial and Commercial Medium/Heavy Duty Equipment. Series #35 / Medium/Heavy Duty Cold Forged Casters Capacities to 1,500 #. Platform trucks, Medium Duty Caster Streer Trailers, Towline Carts, Maintenance Carts, Freight Terminal Carts, Mobile Platforms. Heavy Duty Platform Trucks, Caster Steer Trailers, Towline Carts, Heavy Duty Production Fixtures and Racks, Welding Fixture Tables, Power Drawn Equipment, Mobile Storage Racks, Steel Handling Carts. Heavy Duty Platform Trucks, Welding Fixture Tables, Power Drawn Equipment, Tow Line Carts, Heavy Duty Production Fixtures, Steel Handling Carts. Medium/Heavy Duty Power Drawn Equipment, Manually Moved Machinery and Equipment, Tow Line Carts, Caster Steer Trailers, Steel Handling Carts, Heavy Duty Production Fixtures, Welding Fixture Tables, Mobile Storage Racks. Heavy Duty Power Drawn Equipment, Machinery Dollies, Production Fixtures, Portable Steel Storage Racks, Heavy Duty Work Benches, Die Tables. Series #100 / Pneumatic Casters Carts and Platform Trucks for use in commercial and institutional environments. Where floor protection, ease of movement and quiet rolling are required.